Dr. Gerry Quinn, is a scientist who had lived in the West Fermanagh Scarplands called Boho (pronounced Bo) in Northern Ireland. In Boho the soil is traditionally used in folk medicine for treating infections and Dr. Quinn also knew about this reputed cure. Dr. Quinn, was a member of a team of researchers from Swansea University Medical School, who discovered a previously unknown Streptomyces in Boho’s alkaline and high radon soil that shows promise against deadly antibiotic resistant strains of bacteria. 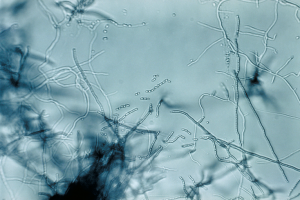 Streptomyces are well-known for producing antibiotics. The results of this research were published in Frontiers in Microbiology, October 16, 2018. Sometimes just a tiny scratch is enough to get an antibiotic resistant skin infection. In this case, the scratch becomes a purulent wound with pain and pus forming and instead of gradually healing the wound gets more and more infected and there is a danger of it spreading throughout the body and developing sepsis. Sepsis, commonly called blood poisoning, is a life-threatening bacterial infection that if not stopped in its tracks, can lead to death. Read more about sepsis in our blog post from September 4, 2018. Ethnopharmacology is the study of traditional folk medicines from which many medical discoveries have been made. The Boho Irish traditionally have taken a small portion of the Boho soil wrapped in cloth and placed it next to an infection or under the pillow of an infected person for nine days. After the person was healed, the bit of dirt was returned to the place it was taken from. This insured that the area would remain relatively untouched and would continue to be an area of healing unlike similar places in other parts of the world that became totally ruined by people who over-used certain places until nothing was left. A Boho soil sample was taken July 28, 2015, from an alkaline escarpment region at the Sacred Heart Church in the townland of Toneel North, Boho, Fermanagh, Northern Ireland. The door of a nearby building contained written instructions regarding the traditional uses and practices of the Boho soil. At this collection site the test soil was placed with a sterile spatula into small cloth bags. When the scientists were through testing the soil samples they were returned to the place they were collected from in accordance with tradition. Results from preliminary screening of the Boho soil samples isolated eight (visually different) Streptomyces-like colony types of bacteria. Out of these eight isolates, the Streptomyces sp. myrophorea, isolate McG, consistently worked the best to stop the growth of both Gram-positive and Gram-negative bacteria and this myrophorea isolate was selected for further characterization and testing. If you or your loved one are in need of rehabilitation that includes wound care, choose a rehabilitation or skilled nursing care facility that specializes in complicated wound care like the Royal Suites Healthcare and Rehabilitation in Galloway Township, New Jersey. To read more about complicated wound care see our blog post from July 4, 2018. It is to be hoped that these newly discovered Streptomyces bacterial colonies that were found in the Irish Boho soil will lead to cures for many of these antibiotic resistant bacterial strains and thus countless lives will be saved.